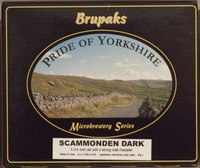 Scammonden Dark Ale is a rich, dark ale with a strong malt flavour and slight, subtle, "treacle-like" aftertaste. A two can kit from the Brupaks Pride of Yorkshire Microbrewery Series which produces 40 pints of a rich,dark, malty beer and a smooth hop flavour. This can be enhanced by using the bag of hop pellets supplied with the kit. It is a rich, dark, malty beer with a subtle "treacle-like" aftertaste. As a premium homebrew beer kit, no additional sugar is required other than as priming sugar during the barrelling or bottling process.